Perf10 is arranged for the 6th time here in Pori. 22 artist from Finland and other countries will do some performances at the Gallery 3h+k in Pori Finland. 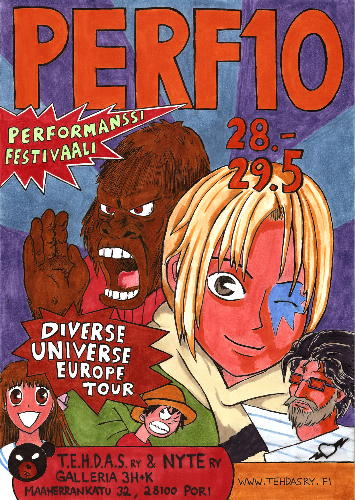 This time we also work togheter with DIVERSE UNIVERSE, wich is traveling and performing arround Europa. The organizers are T.E.H.D.A.S. and NYTE like always before. 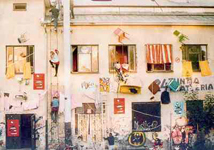 The festival will be happenig in the center of Pori at the Gallery 3h+k. The performances will be also outside of the gallery. Perf10 provides live performances for two days for you who want to experience something. Remember also Perfo! in Tampere at the restaurant Telakka 25.5.2010. Welcome to Pori. We arranged for you visitors some kindda sleeping place at the culture house Annis. Adress and maps can be found at the Gallery 3h+k.